Rockstar games recently announced that The Music of Grand Theft Auto V, a trio of albums from Grand Theft Auto V, are available on iTunes for £7.99 each or as a full compilation for £17.99. The first volume of the compilation is a collection of brand new music from a wide array of artists including Wavves, Twin Shadow and Tyler, The Creator - along with The Chain Gang of 1974's ‘Sleepwalking’, which was featured in the game's official trailer. GTAV is the first entry in the series to feature an original score composed and engineered to be completely responsive to the player’s actions within both missions and open world gameplay. The score was composed in a one-time collaboration between a team of producers and composers including German electronic band Tangerine Dream, Woody Jackson (Red Dead Redemption, L.A. Noire) and hip-hop producers The Alchemist and Oh No. 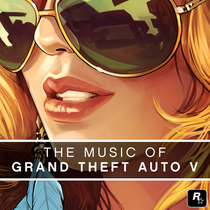 For The Music of Grand Theft Auto V: Volume 2, the stems of the game’s interactive score are layered, mixed and arranged into an album of songs by acclaimed producer and DJ, DJ Shadow. The collection of music in GTAV is the biggest and most ambitious in the history of the series. Volume 3 features select songs from across the game's unique in-game radio stations. Snippets from all 17 in-game radio stations are also now available to check out on the Music page on the GTAV official site and features tracks by Bootsy Collins, Flying Lotus, Bob Seger, Jai Paul, Toro y Moi, Waylon Jennings and more. For full tracklisting info, check out: www.rockstargames.com/V/music.